Many of you have seen that I have posted about the company Body Zone Swim that is using my pattern for one of their new swim suit line. I loved working with them - mostly because the founder is also a female entrapranuer that is totally rocking it - women working with women - love it! I wanted to give you an behind the scene peak about how I did the design process. I started with this painting that I painted a few months before. I took a photo (so much easier then scanning) and imported it into Adobe Illustrator and used image trace to get the organic feeling shapes. I then worked with the individual shapes to re-work the pattern making sure that the shapes match on the top and the bottom - and then side to side. This puzzle is one of the most challenging but fun parts of pattern making. I love how the process of creating a repeat transforms a group of motifs into a new art piece. It is such a magical moment right before you see how the pattern repeats in large scale. Art board of my repeat tile - you can see how the shapes match - top and bottom - side and side. As a self taught pattern designer - skillshare classes have invaluable in learning how to create repeats. Bonnie Christine and Elizabeth Olwen have the best classes on all things pattern design and are a delight to learn from. This is the final result - you can buy the suite below from Body Zone here - Or pick a style and add my pattern! This project was so much fun and I can't wait to continue to design and see where my patterns end up next! I would love to be in touch about any questions, collaboration, project ideas that you have - feel free to email me at Courtney@courtneybeyerdesign.com!! This is me at 14, leaping into a cool pool on a warm summer day. Wish this is always how I feel, but it's always the goal! It’s been almost 6 months since I took a crazy leap, quitting my tech job as a product designer and becoming a surface pattern designer and artist. We have all read stories about people taking a leap and how they came out the other side. This is a Q&A I did with a friend who wanted to know what it like to take the leap - but still struggling to fly (ok maybe still just falling). This is a little insight into what I have been up to the last 6 months starting Courtney Beyer Design. Tell me about yourself in 5 sentences or less! My name is Courtney Beyer and I am 30 years old, I grew up in the bay area and currently live in Menlo Park with my husband. I am in the middle of switching careers from a product designer to surface pattern designer and artist. I graduated from the University of Michigan with a degree in Anthropology and was captain of the varsity swim team. And I love ending the week (ok maybe a few days a week) with a glass of wine. After a birthday trip to Spain and Morocco, I was inspired to start creating with my hands again and a few months later in January of 2017 Courtney Beyer Design was born. I specialize in block prints and surface pattern designs. I sell hand printed cards, journals and tea towels on my etsy shop, I am working on a pattern line (you can see my progress on IG @csbeyer), and I teach corporate and private block printing classes. Interested in a class? Let me know - we’ll chat. What does it feel like to be in the midst of risk taking and dream chasing? Crazy, scary, and very uncomfortable. There is a constant mental battle between doubts and aspirations. I created a toolkit (see below) to help combat all of my inner doubts and fears that are constantly trying to drag me down and hold me back. I know that the only way I am going to feel more comfortable being uncomfortable is to continue to take risks and put myself out there. On the other side, I have felt so excited and alive these past few months and I am realizing that anything is possible. By nature, I move fast and love getting stuff done. For the first time I can work as fast as I want without waiting for approval or convincing by boss that something is a good idea. I can just do it and if it does not work I am on to the next thing. I feel like I am creating something that is truly authentic and I deeply care about. If someone told me I had 6 months to live I would continue doing what I am doing today, (maybe add in a trip to Greece) but I think that proves to me that I am on the right track and I am doing something worthwhile. I know I have a long road ahead but I am loving the journey. How are you financially making it? I am not right now - like any start up I have my own personal runway with quarterly goals - I am working like mad to start generating revenue before the investment is gone. I have diverse revenue streams, as well as a bridge job at Paper Source to help fund my projects. I know it is not going to be easy but what the past few months have shown me is that there are so many opportunities out there but you have to be willing to reach out for them (which is always the hardest part). What are your best strategies for faking it 'til you make it? Do things before you are ready. Body Zone Swim is using one of my patterns for their newly launched swimwear line. When I had reached out to the company a few months ago, I did not even know how to make a digital pattern. I had been doing a lot of drawings that looked like patterns but none of them were digital repeats. They liked my drawings and and said yes - which then forced me to figure out how to make a digital pattern. The old Courtney would have NEVER done this. I would have felt like I needed to go to a class, and create many patterns and get lots of feedback from experts before I was “worthy” of submitting a pattern to a company. Keeping a lot of balls in the air. An important mental strategy for me is to have a lot of things going on at once so I am never worried about or waiting on one item. When sales on my etsy shop are slow - that’s ok because I am working on my pattern line or scheduling a block printing workshop. I want things to happen a lot faster then they do so if I can be working on another project then I can be patient. I am very much in the stage of creating as much work as possible as I craft my style and point of view. What is the most important skill you've learned these past 6 months as a founder? Being humble and vulnerable (oops that’s 2). Telling my family and friends that I was not going to be working at tech company anymore and making $X but going to do art and make $0 was really hard. I thought (I still do - as I tell more people) that I was/am being judged for making a “irresponsible” decision. I have been “doing the right thing” my whole life and stepping out of that mold seemed SO wrong. Living in Silicon Valley there is a lot of pressure to be a certain kind of success and make a lot of money a certain kind of way. I am going against those “shoulds” and doing something that at face value financially does not make sense. As I have told more people - now you- the opposite has happened and people have been so supportive. Being vulnerable and sharing my vision with friends and family has allowed me to ask for help; critical to getting my business up and going. What is your AM ritual? My AM ritual is very much in flux -except making the bed, which I do everyday. I am trying to meditate everyday -(but just 6 minutes that is about all I can handle). I do have a very steady evening ritual. I brush my teeth etc. Once in bed I journal - my journal also has a blank schedule for each day. I review what I had wanted to get done for that day, and if I accomplished my top 3 goals. Then I do a little journaling and write down my schedule for the next day. Reflecting at the end of the day and going to bed with a game plan for the next day calms my mind and puts the planner in me at peace(ish). I guess my new ‘stand up’ is a ‘lay down’? What was the toolkit you mentioned? Thank you so much for taking the time to read my Q&A about my journey so far. Please feel free to get in touch if you have any questions or are thinking about starting your venture. Like I mentioned I am always excited to collaborate with companies and do team building workshops! Flat Valentine’s Day Tablescape - 2 Ways! I have been working on a few Valentine’s Day projects recently. I just launched my Esty shop with my Valentine’s day card line. Check it out ----> here. I have also been working on a fun Valentine’s Day tablescape idea inspired from my Flat Thanksgiving Tablescape. I wanted to create beautiful and fun pieces that could be used at home or at a restaurant. They are easy to make or I might sell these. Any interest? Watercolor a few pieces of paper. I used more purples and pinks, but using just reds would also look amazing. Once the paper is dry - draw or trace different size hearts on the painted paper using a pencil. I hand drew them. All the hearts cut out. We went to the Left Bank in Menlo Park for a lovely french dinner. I brought the hearts in a folder and then when we sat down I laid them out on the table. Guys - I am sure you could arrange to have this pre-done - hint, hint. Our server loved them - she also appreciated that they did not get in way. I think the hearts work best on tablecloth but any table surface would be fine. As our drinks and meal came out we just placed everything over of the hearts. The hearts added such a fun pop of color to the table but did not get in the way of the meal. They are also fun to play with during dinner and to write little love notes - hehe. Sweet love notes written on the hearts during dinner. Post dinner shot. The hearts moved around a little but never 'got in the way'. My cute husband - indulging me as I test out my ideas! I set up a simple yet romantic tablescape with homemade candles (future blog post about how to make these), white plates, linens and the hearts. Even in dime lighting they create a beautiful design and add to the ambiance. You can always add flowers or other decor with the hearts but I wanted to show how the hearts can be stand alone. Have you done something similar for Valentine’s day? Interested in purchasing these hearts? Let me know. It is the third day of the new year, and my Christmas decorations are still up and it is drizzling outside. Before I take them down, I want to spend a little time reflecting on the holiday season. Christmas time always inspires me to create and make. From homemade gifts, to holiday decorations, to cooking for friends and family, I always have too many ideas and too little time. There was just no time to share during December so here is a peek back at some of my holiday projects! I decided to change things up this year and only decorated my (yes - fake) tree with all natural ornaments. 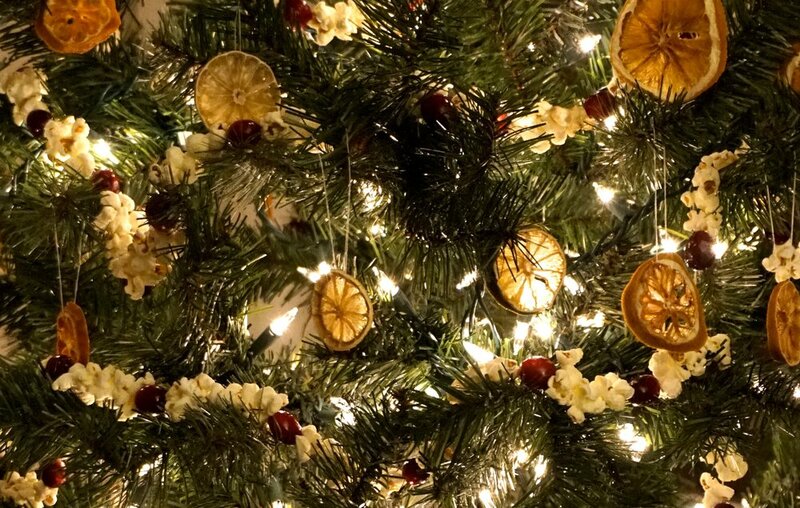 I dried oranges, tangerines, lemons and limes to make ornaments and then strung popcorn and cranberries for a garland. 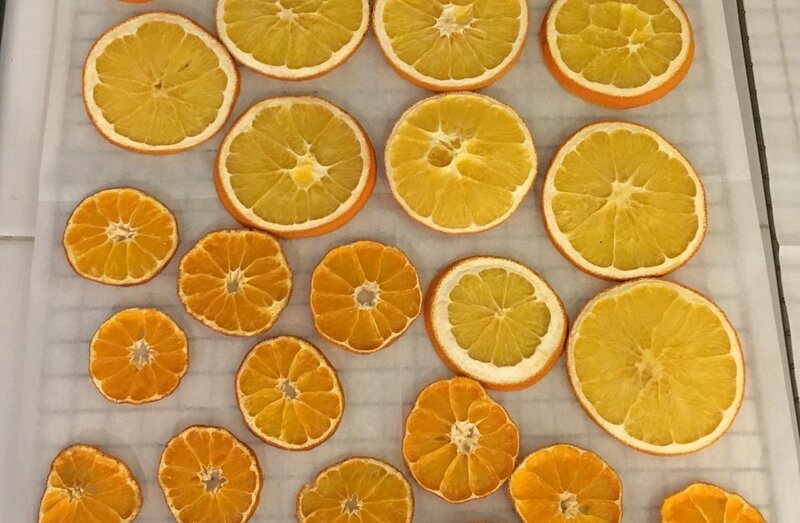 I was so happy with how the dried citrus turned out. The lights shined through the dried fruit at night looks like stained glass and was just beautiful. I am curious to see how everything holds up in storage and what I can use for next year. I wanted to learn the process of painting a design and then digitizing, and finally printing it on paper. I used our holidays cards as perfect opportunity. I had seen some beautiful wreaths on Instagram and wanted to paint my own! I painted a few wreaths and went with the most colorful option. I took a photo and then worked with my sister to edit it photoshop. Let’s just say I still have a lot to learn when editing hand painted designs in photoshop. I added text and saved the whole design. I used the TinyPrints “upload your own design” holiday card option, which let me use my wreath design for front of the card and then I added a few photos to the back. It was exactly what I wanted! I was so pleased with how they turned out and we got them mailed by the 27th of Dec! Throughout the year I keep the kraft paper that Amazon and other retailers use as stuffing in their shipments. The quality of the paper is really nice and comes in large squares perfect for wrapping paper. In the past I have kept the paper plain and used a festive ribbons, or written holiday sayings on the paper with a calligraphy pen. This year I decided to block print my wrapping paper. I started with carving a few holiday stamps - leaves, holly berries, and poinsettia flowers. Using just red and green for every pattern helped make all my wrapping paper cohesive and the less “holiday” stamps still look holiday-y. I just had fun playing around with the stamps and seeing what patterns I could create. A few of my gifts were gift cards so I made a few block print cards to hold the gift cards. It was my first time block printing on cards. I have a few ideas for the future! A lesson learned only after I started wrapping my presents with the block printed paper was that my patterns needed to be tighter together. With some of my small gifts you could not really see the block printed patterns! It is only now that I realized I did not take any photo of the presents packages wrapped up. :-(. One a cozy Saturday night in December, when I was stringing popcorn and cranberries, I asked my husband if he wanted to run to the store to get some eggnog. I had just purchased whole nutmegs and I wanted to grate fresh nutmeg over eggnog - hmm yum. He was already in his PJs and said no, I was also in my PJs, so I looked online to see if I could make homemade eggnog. After reading a few recipes I realized it was really easy and we had all the ingredients -eggs, milk, sugar, bourbon, and nutmeg. 30 mins later I was curled up on the couch, sipping homemade eggnog wondering how I got this far in life without it. It was so much better than store bought and without tons of preservatives. This is the recipe I used. One tweak to the recipe was that I stirred in freshly grated nutmeg and grated nutmeg on top right before serving. I had a plan to make all homemade gifts this year - that was a beautiful and crazy idea. The one semi-homemade gift I did make was: candle mugs for my sisters and mom. I bought beautiful mugs from Anthropologie and then made them into candles. I use soy wax which is super easy to melt, waxed wicks. They can use the candle and then when it burned down they can can easily clean out any extra wax and use it as a mug, or I will gladly make it into another candle. I think it is a fun idea to “dress up a gift”. Any projects that you loved creating this past holiday season? Any wintery decorations that still work in January and February? I am sad to take down the tree but I am excited to start working on Valentine's Day projects!